When we talk about catching dolphin, we are talking about the dolphin fish. 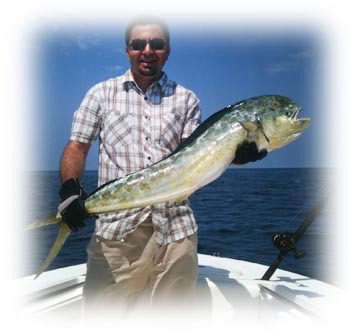 Depending on where you're fishing, they are also known as mahi-mahi or dorado and all are one in the same fish. These colorful gamesters are the most sought after fish in our waters during the April, May, June, and July time frame. That's the time of year when they are most abundant; however, they can be caught year round in the waters off Miami and Miami Beach. By and far, the most productive method of finding the dolphin is to use a run and gun technique. That means we run Knot Nancy at the quickest most comfortable speed for the conditions until we find some type of structure, bird activity, or both that would indicate the possible presence of dolphin. At that point we put out live baits and if the dolphins are around, it won't be long before we hook up. Since they are generally a schooling type fish, when the hooked fish is brought along side of Knot Nancy, the rest of his buddies will follow him and the water will turn blue, green, and gold with fish swimming around the boat and looking for a meal. That's when the action will get fast and furious. As fast as we can get baits in the water, we'll be hooked up and catching hard fighting and high flying dolphin. Yes, they jump and pull hard. It's common for a group of four (4) anglers to all be hooked up at once till the fish loose interest and move on. If casting jigs to catch fish is the way you like to fish, then dolphin will definitely please you. They are suckers for ¼ to ½ ounce jigs. The favorite jig used aboard Knot Nancy is the Kaplan Jig in the pink/white and chartreuse/white colors. Do you want a chance at doing battle with a large dolphin? Then April and early May is the best time. Fish in the 20 - 30 pound range are quite common at that time of year. Fish in the 40's and occasionally over 50 are also caught during that time of year. These large dolphins will test your strength, patience, and angling skills to the max. Looking to have a fish fry or want to put some dolphin fillets in the freezer? 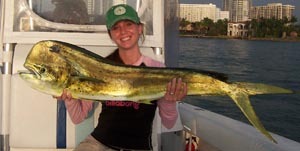 When we find a school or several schools of dolphin, it is very common to catch our limit of 10 fish per angler. There is a minimum size limit of 20 inches as measured from the lower jaw to the fork of the tail. This size limit is strictly adhered to aboard Knot Nancy. Dolphin fishing is also great as a family activity. Everyone can participate and Mom and Dad, your children will have grins from ear to ear when they hook up, fight, and land their dolphin. 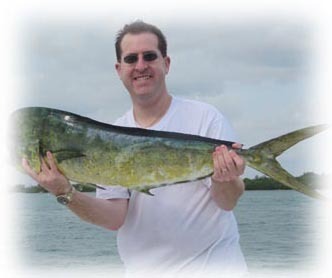 To schedule your dolphin fishing trip, give Captain Dave a call at 305 965-9454, email him at nkostyo@bellsouth.net or go to the rates page for more information. It's that easy to schedule your charter.